Jetstar Asia is continuing what it sees as the decade of North Asian expansion with a service to Guangzhou, the third largest airport in China with 1.1 million weekly seats available. By comparison, London Heathrow has 1.7 million weekly seats available. Jetstar sees greater growth prospects in North Asia, which has a LCC penetration rate of under 5% compared to approximately 30% in Southeast Asia. The Guangzhou route is the latest in a big push by Jetstar into China. It launched service to Ningbo last month and is launching service to Beijing next month. With Guangzhou, Jetstar Asia will have seven destinations in mainland China and 10 in greater China. Two more Chinese cities are expected to be added by the end of this year and many more in subsequent years. “There are many, many cities” in China that Jetstar is prepared to serve, CEO Bruce Buchannan previously remarked. 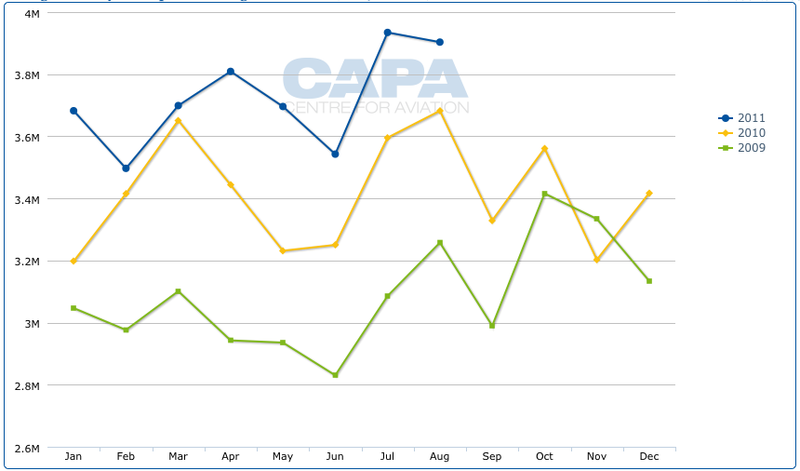 Close readers of CAPA may not be surprised by the route selection – it was one of three possible new China routes we flagged back in July. It was then Mr Buchannan remarked, "In this decade, we believe North Asia will flourish." The daily route to Guangzhou commences from 22-Dec-2011 with what Jetstar says is the 16th A320 for the carrier's Singapore hub. But the flight schedule makes apparent the route does not necessarily require a new aircraft but could instead be operated by one of Jetstar's A320s that overnights at Singapore. A Jetstar Asia spokeswoman confirms the carrier's 16th A320 is being used during daytime hours to launch service to Hanoi and add capacity to Kuala Lumpur and Hong Kong. In July the carrier unveiled plans to launch four weekly flights to Hanoi from 15-Dec-2011 and to add capacity on several existing routes including Kuala Lumpur and Hong Kong. The new route also underscores Jetstar looking to link its intra-Asia services, and not its long-haul flights to Australia and New Zealand or Qantas flights to Europe and Australia. Like the Singapore-Beijing route announced in Jun-2011 for service from 24-Nov-2011, the Guangzhou flight is timed to primarily connect with regional Asian flights, and not Jetstar or Qantas long-haul services. Jetstar Asia CEO Chong Phit Lian says services to Shantou, Haikou and in particular Dalian mainly cater to Singaporeans as well as Indonesians and Malaysians. All three countries have large Chinese populations. The Indonesia and Malaysia passengers are connecting in Singapore from Jetstar’s two Malaysian and four Indonesian destinations to China. Unlike most other LCCs, Jetstar offers a connection product with bags checked through to the final destination although Ms Chong says some Indonesian passengers choose to self-connect and have a stopover in Singapore, where many Chinese Indonesians have family and friends, before travelling onto China. Ms Chong expects the Beijing flight will also attract a lot of Indonesia originating passengers. In fact the Singapore-Beijing flight is scheduled to connect better with other Jetstar destinations in Asia rather than Qantas Group destinations in Australia. The Beijing route's timing was also due to slots that were not Jetstar's first preference, but Mr Buchannan said at the time the carrier could look later to attain more favorable slots. For service to mainland China's second-largest airport, Shanghai Pudong (with 50,000 more seats per week than Guangzhou), Jetstar has secured slots, as well as to China's sixth largest airport, Shenzhen. Both are logical airports for Jetstar to launch to next. Jetstar is expected to make more route announcements in Asia over the next few weeks. The group is planning to end the year with 17 Singapore-based A320s and four Singapore-based A330s. 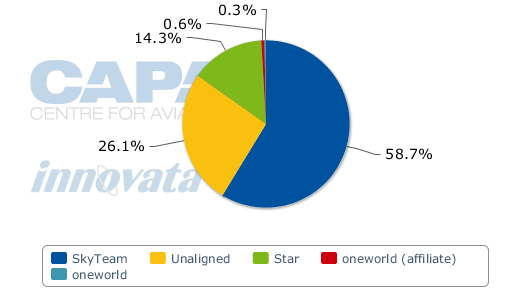 So far the carrier has only announced capacity plans for 16 of the A320s and three A330s (Beijing is made possible with the delivery of the third A330). As a result one or two more short/medium-haul routes and one more long-haul route are still to be announced. Jetstar Asia earlier indicated it planned to have 12 routes to greater China by year-end, which suggest at least one of the new A320 routes and possibly the A330 route will once again involve China. Shenzhen and Shanghai are the most likely alternatives. Shanghai is an option for either aircraft type as it is just within range of an A320 but the value of Shanghai slots could persuade Jetstar to use the larger A330 on the five-hour flight from Singapore. Jetstar's addition on the Singapore-Guangzhou route will add competition to China Southern, Singapore Airlines and Tiger Airways, who all serve the route non-stop. 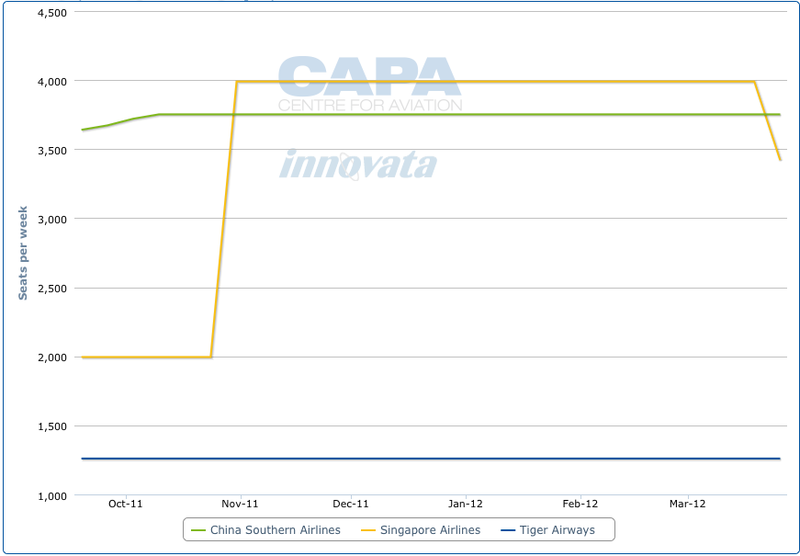 Singapore Airlines (SIA) is doubling capacity to Guangzhou at the end of this month, when it adds a second daily flight. Singapore has the second largest number of international direct seats a week to Guangzhou, just behind Kuala Lumpur and Bangkok. The additional flight from SIA and the new flight from Jetstar will result in an over 20% increase of capacity on the route, making Singapore the second largest international route from Guangzhou. AirAsia, which like Jetstar is pursuing a pan-Asian LCC strategy, provides 3,780 weekly seats from Kuala Lumpur to Guangzhou, which so far this year has experienced higher growth every month than the previous two years. 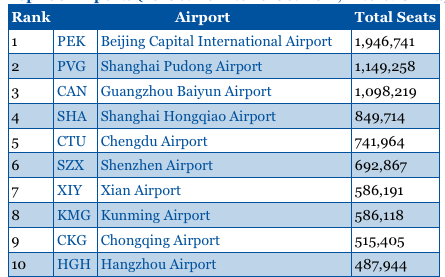 Fifty-nine per cent of traffic at Guangzhou is from SkyTeam, whose Chinese members China Southern is based there. 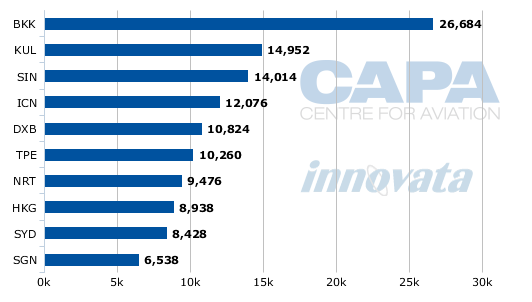 Unaligned capacity (such as from LCCs) accounts for 26% of capacity. Jetstar increased its China capacity by 300% in 2010 as service to Guilin and Shantou was launched. Its China capacity will grow another 150% in 2011, driven by the launch of flights to Hangzhou early this year as well as the launch later in the year to Ningbo, Beijing and Guangzhou. Jetstar’s China capacity will likely double again next year as more routes are launched and due to the full year effect of the routes added in 2H2011.